A wooden deck without stairs is literally useless. Building deck stairs is certainly not an easy task. However, the following stepwise procedure can make things relatively simple. Without any further delay, let’s begin the project. The first thing that should be done is to measure the distance between the base of the deck and the ground. Divide this measurement by 7.5; the result will be the number of stairs the staircase will have. For instance, if the measured distance is 115-inches then the number of stairs will be 115/7.5 = 15.33 that is 15 stairs. 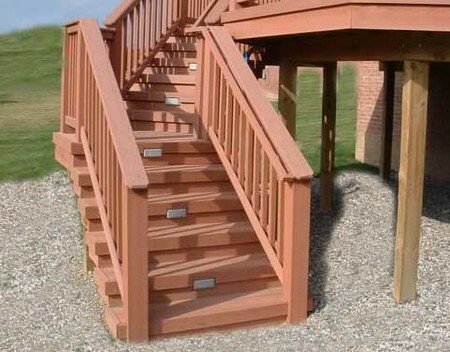 To determine the height of the staircase, divide the distance from the base of the wooden deck to the ground by the number of stairs computed in the last calculation. For example, in the above case, the height of the staircase would be 115/15 = 7.66-inches. To ascertain the length of the staircase, multiply the number of stairs by the height of one stair. The standard height of a stair is 10-inches. So, the length of the deck staircase would be 10 x 15 = 150-inches. As far as the width is concerned, it is advisable to use the standard measurement, which is 36-inch. Mark the point where the staircase would meet the ground. At this point, dig a foundation that is about 6-inch deep. Remove dirt, grass and debris from the region. Use tamper to level the ground and add pea gravel and over it pour cement. Allow the cement to dry for 24 to 48 hours. 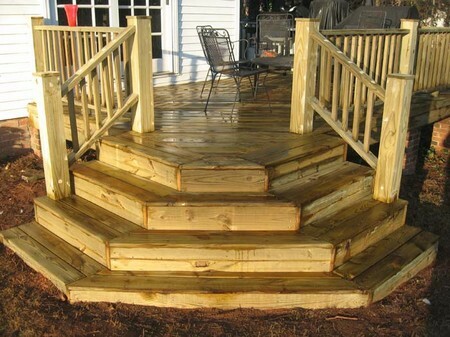 The next step is to create the sides of the deck staircase. For this 2’’ x 12’’ boards should be used. On the top corner of the board, place the square in such a manner that the rise is 7.66-inches and the tread is 10-inches. Trace the cut lines along the inner side of the square. The point at which the last line comes out of the board, trace the next mark. Repeat the process until the entire stringer of the staircase is formed. Use circular saw and hand saw to cut out the sides from the board. Attach one end of the stringer to the deck and the other end to the concrete pad. Use angle brackets and galvanized deck screws to affix the sides of the staircase. Use 2’’ x 6’’ board to make the footer that snugly fits between the stringers and rests on the concrete pad. Affix the footer on the pad with the help of masonry anchors. The next task is to cut and attach treads. The width of the staircase is 36-inches. Take 2’’ x 6’’ board and cut out treads that are 38-inches in length. Allow the treads to overlap the stringers. Fasten each tread to the sides with the aid of galvanized screws. The last step is to make the railing. Use 2’’ x 6’’ board to make the railing. Cut 4’’ x 4’’ posts such that they are 30’’ in length. Create notches on the treads and railing for the posts. Use deck screws to attach the posts to the tread and railing. With this the deck staircase is ready for use.